Imagine a study guide actually designed for teachers! Because we know you’ve got a busy life, we’ve developed a study guide that isn’t like other certification materials out there. 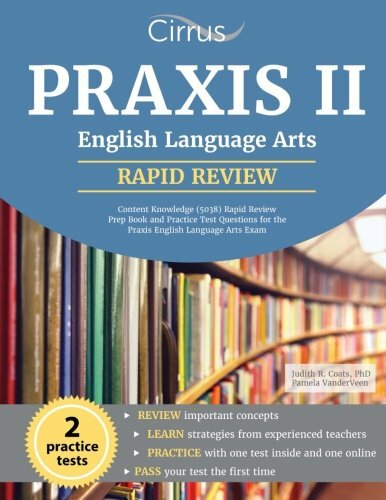 With Cirrus Test Prep’s unofficial Praxis II English Language Arts Content Knowledge (5038): Rapid Review Prep Book and Practice Test Questions for the Praxis English Language Arts Exam you get a swift but full review of everything tested on your certification exam. FREE online resources are also included with your study guide! Imagine having FREE practice questions, digital flash cards, study “cheat” sheets, and 35 test tips available anytime, anywhere on your cell phone or tablet. Cirrus Test Prep’s resources will give you the push you need to pass your test the first time. …as well as a FULL practice test. Developed by experienced current and former educators, Cirrus Test Prep’s study materials help future educators gain the skills and knowledge needed to successfully pass their state-level teacher certification exams and enter the classroom. Each Cirrus Test Prep study guide includes: a detailed summary of the test’s format, content, and scoring; an overview of the content knowledge required to pass the exam; worked-through sample questions with answers and explanations; full-length practice tests including answer explanations; and unique test-taking strategies with highlighted key concepts. Cirrus Test Prep’s study materials ensure that new educators feel prepared on test day and beyond! If you have any questions about this product by Cirrus Test Prep, contact us by completing and submitting the form below. If you are looking for a specif part number, please include it with your message.